[Ottawa – April 26, 2016] We begin with a look back at the aftermath of the 2011 election. 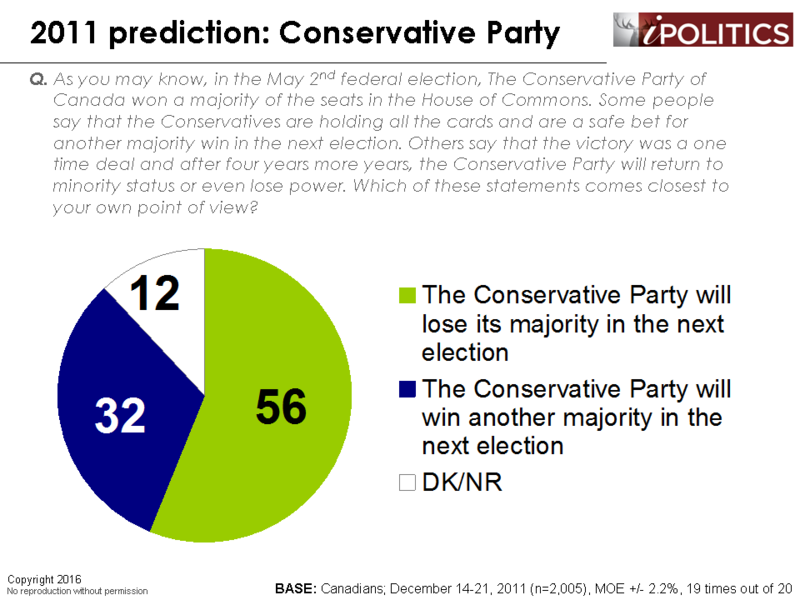 The Conservatives had just won a convincing majority government. The NDP, a party that had never garnered more than 20 per cent of the popular vote, made history by forming the Official Opposition for the first time. Meanwhile, the Liberals had been nearly annihilated and, after watching their seat tally decline for four consecutive elections, seemed to be spiralling into oblivion. In the wake of the 2011 election, we saw mass confusion and misinterpretation of the future, with various authorities talking about the “blueing” of Canada, a “big shift”, and the death of the Liberal Party. It is of little surprise that we are hearing similar questions about the future of the NDP and the ability of the Conservatives to recover power. 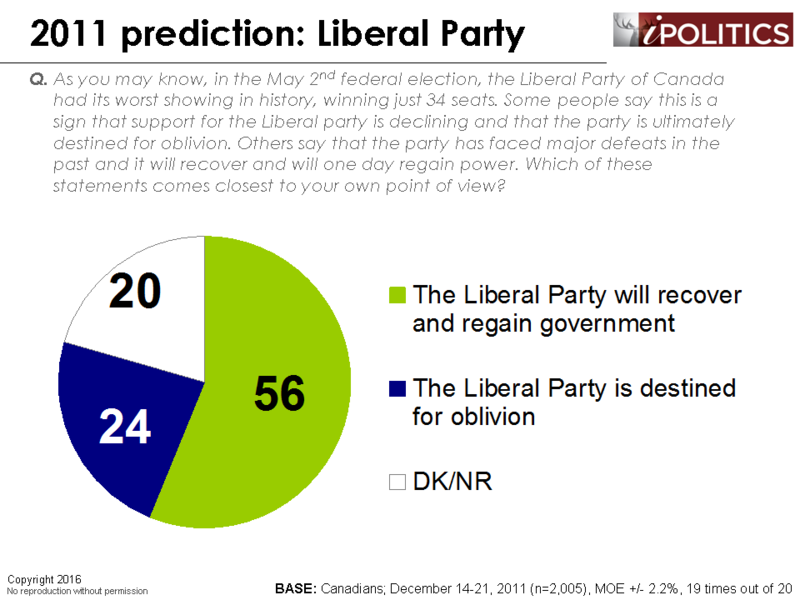 It is therefore interesting to look at what the Canadian public thought was going to happen. As we shall see, there is a “wisdom of crowds” (at least in this case). The Liberals were not destined for the historical dustbin and the party would reform government. Fast-forward to 2016 and, low and behold, the public was right on all three counts. Inspired by the public’s collective wisdom and noting what has been a horrific year for the NDP, we asked Canadians what they see in the NDP’s future now that they party has been relegated to third place. 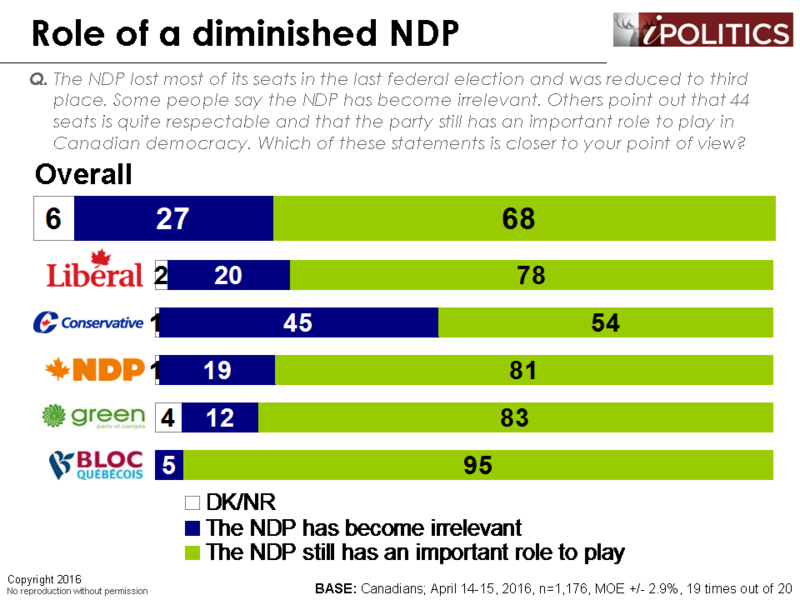 By a wide margin, the public still sees life in the party and believes that the NDP is still an essential force in Canadian democracy for the foreseeable future. 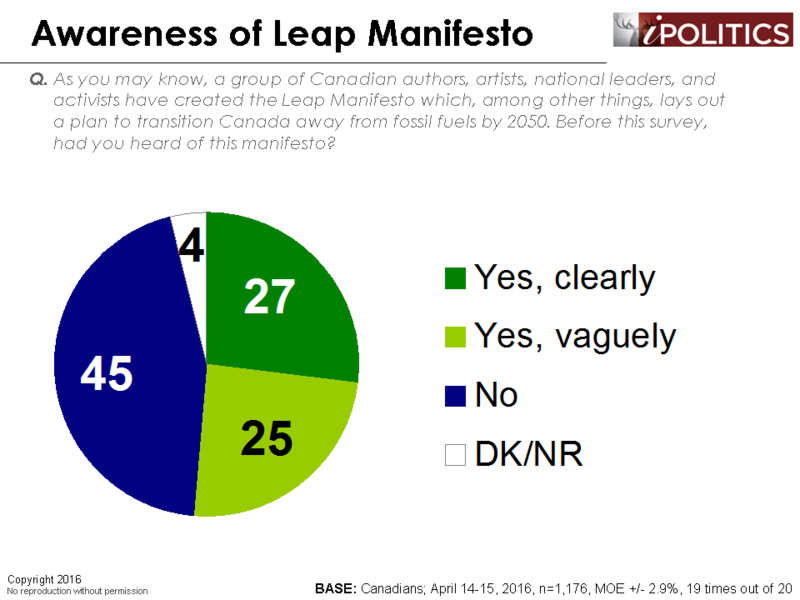 Among Liberal, NDP, Green, and Bloc supporters, there is a virtual consensus that the NDP still has an important role to play. 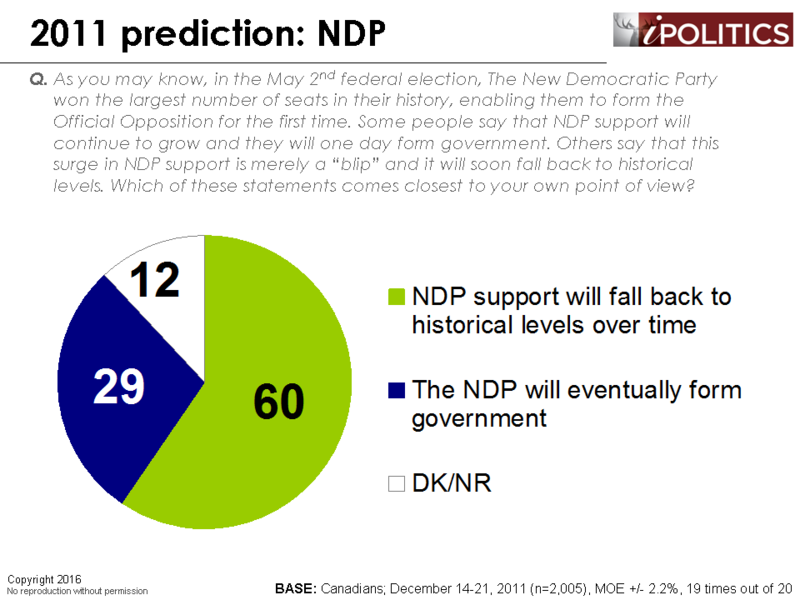 Even among the more skeptical Conservative supporters, a majority see a brighter future for the NDP. The bold and controversial Leap Manifesto produced a lively discussion and some stark divisions in the NDP constituency. In testing awareness and approval, we found there was moderate awareness of this manifesto. A little over half said they had heard of it, including 27 per cent who say they’ve clearly heard of it. Not surprisingly, awareness is highest in Alberta. More importantly is whether the public approve of this. Before delving into the results, we note that these responses should be taken with caution given the low fluency about the actual proposal and the very limited description we were able to provide in the poll question. 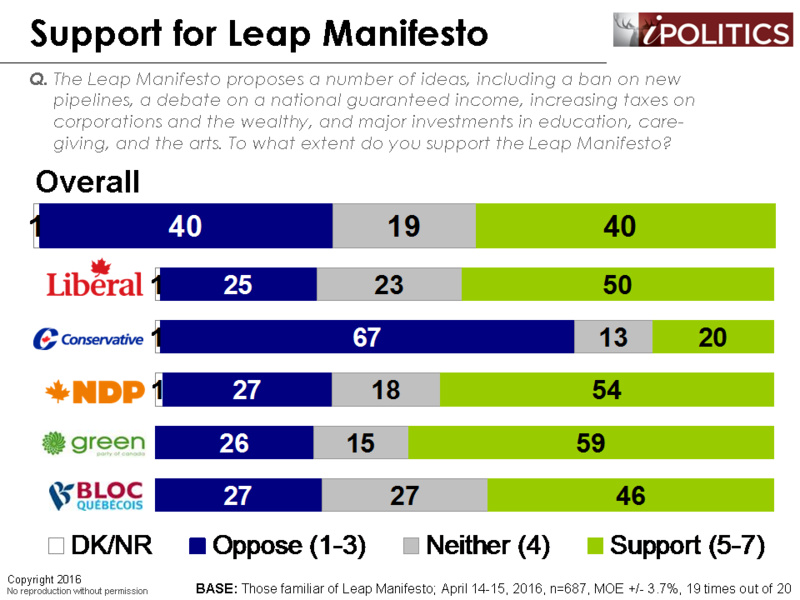 Nonetheless, the Leap Manifesto certainly split Canadians between those who support it and those who oppose it. Interestingly, support outweighs opposition by over 2-to-1 for all of the progressive party supporters. Conservatives are in a different place altogether with just 20 per cent feeling the ideas proposed under the Leap Manifesto are good ones. Support is highest in British Columbia and Quebec (i.e., the new progressive vanguards of Canada), as well as Ontario and among women and university graduates. Stephen Harper, come on down! In a little over a year, members of the Conservative Party will gather to choose a successor to Stephen Harper. While we would advise against reading too deeply into a survey conducted more than a year ahead of time and long before we even have a full roster of candidates, the results are highly interesting. It is also important to note that while there are no fewer than 10 credible candidates who have expressed interest in running for leadership, due to the limitations of IVR, we were only able to include six candidates in the survey. 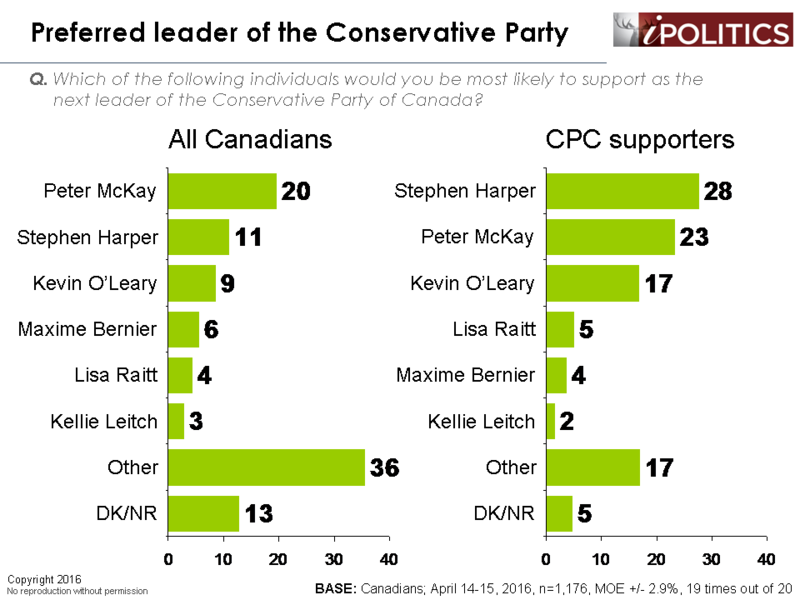 Among all Canadians, Peter MacKay is seen as (by far) the best choice to take over leadership. When we narrow our analysis to Conservative supporters, however, there is strong appetite for giving Stephen Harper another shot. Indeed, Mr. Harper comes out as the clear favourite, followed by Peter Mackay with Kevin O’Leary in third place. It is particularly interesting to note that the only two candidates who have officially entered the race (at the time this survey was conducted) – Maxime Bernier and Kellie Leitch – rank dead last among Conservative voters. The field dates for this survey are April 14-15, 2016. In total, a random sample of 1,176 Canadian adults aged 18 and over responded to the survey. The margin of error associated with the total sample is +/- 2.9 percentage points, 19 times out of 20. Don’t delude yourself or the public. All Parties have Right Wingers dressed in that Party clothing. perception, the benefit of fossil fuels! Capitalism wins by all means….